Has your yoga mat seen one too many downward dogs? 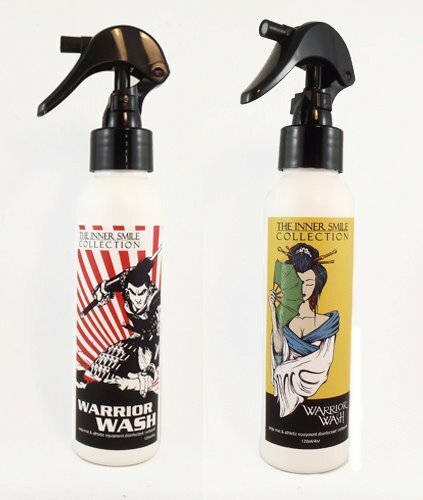 Warrior Wash is a plant based yoga mat cleaner, enriched with pure essential oils of tea tree, lavender and clove to kill those pesky germs, while leaving your mat squeaky clean and smelling fresh. Bring out your inner smile, as you wash your yoga mat knowing you are not hurting the environment or your fellow yogis! Also can be used on any smelly athletic equipment or as a multipurpose household spray because of its natural antibacterial properties. Simply spray on your mat, wipe down and let air dry. aqua, melaleuca alternifolia (tea tree hydrosol) and hammemélis virginiana (witch hazel). essential oils: melaleuca alternifolia (tea tree) oil, eucalyptus globulus (eucalyptus) oil, pinus sylvestris (pine) oil, lavandula augustifolia (lavender) oil, eugenia caryophyllata (clove) oil and cinnamomum zeylanicum (cinnamon) oil.